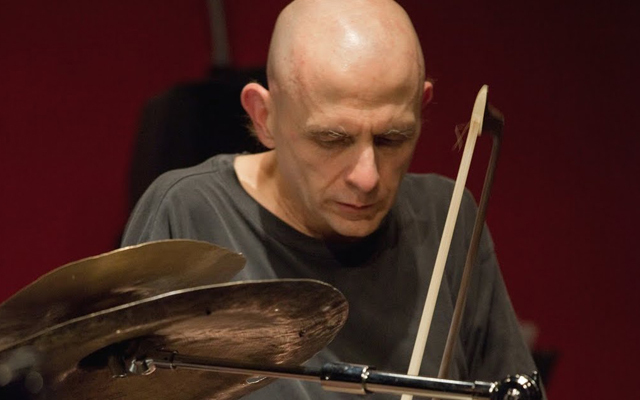 Milo Fine brings to musicianship – its conception and practice – a prodigious intellect and visceral sense of sound and as we can discern right from the title of this recording. apophenia is then a revelation that Mr. Fine is also a polymath. The name of Klaus Conrad, (a psychoanalyst who first used the word (actually he used the German word Apophänie) related to schizophrenia, does not appear emblazoned anywhere on the recording (neither ought it to), the fractal nature of the music offers a poignant insight into – for want of a better way to describe it – the experience of a “musical apopheniac”. 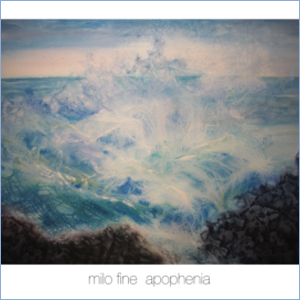 Indeed Milo Fine makes clever use of fractured rhythms, discordant melodies together with a harmonic palette resembling a shattered mirror to provide a heightened sense of the human condition. In this regard the comes close to an encounter with Jorge Luis Borges (Library of Babel) and Umberto Eco (Foucault’s Pendulum) or Stanislaw Lem (as in His Master’s Voice in literature. However, the highly literate sense that we glean from Milo Fine’s music is also accompanied with a more visceral one. “the very ink with which history is written is merely fluid prejudice” is a perfect place to experience both. The title is taken from Mark Twain, but the music – its yammering echo of what sounds like a tin drum struck by hand, punctuated by the sizzle and of a grazed cymbal here and a growl of the tuba and the moan of violin and cello in sotto voce – all seems to favour a proverbial doffing of the hat to Oliver Sacks too. Rightfully so, it may be added, for was it not Mr. Sacks who suggested in such works as Musicophilia that music and emotion go together and run deep as music occupies more areas of the brain than language does, and that humans are primarily a musical species, which in turn, brings us back to Milo Fine’s music. In the starkness of “the occasional dissolution of skepticism” and “the peculiar smell of the inevitable” (the latter is a marvellously found-work) dazzling asides of stick and brush-work on the cymbals pierce the mindstream like bolts of pure sunshine. And in the former the silent spaces seem like sacred spaces resonant with creation. Meanwhile on “don’t underestimate the attraction of oblivion” even a note here and there will ping into existence from a cosmic void. Indeed, every “nothing” is an echo of “something” in the music of Milo Fine and that is how we can celebrate these examples that are masterfully brought forth by Mr. Fine together with intensely like-minded musicians, Charles Gillett, Joseph Damman, Elaine Evans, Daniel Furuta, Sam Wildenaur and Benjamin J Mansavage Klein on this record to die for.